Selfie aboard the Kona Honzo. Most days spent building this trail were cold, dark, and wet. Stoked to have a shot that fits that theme. 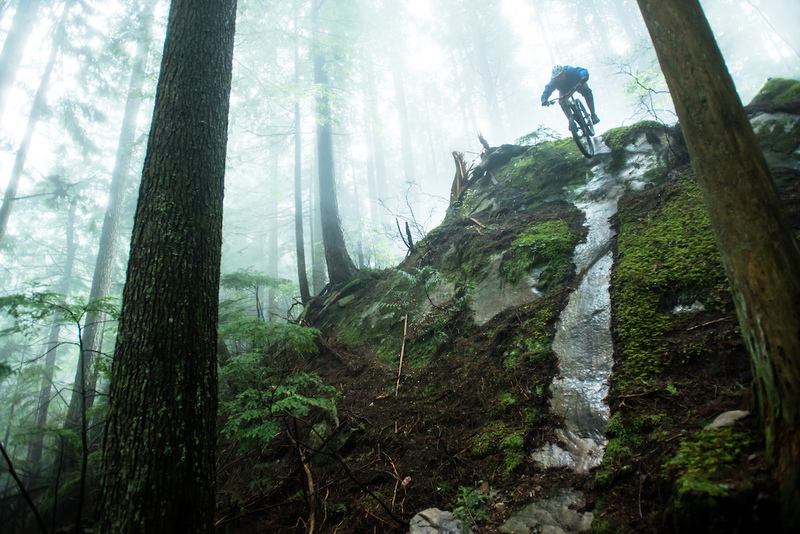 Selected by Mike Kazimer - Foggy woods, mossy wet rocks, and tall trees - this photo has all the ingredients of a classic Pacific Northwest ride. Bonus points go to Brad Walton for airing into this slippery line aboard a hardtail, and capturing it all in a self portrait. The Honzo is a sweet ride! Always amazed and a little jealous of Brad's selfies. So amazed that one guy has such sick skills in building, riding AND shooting it all. Lots of respect for your stuff Brad, keep them coming! Awesome picture Brad! Are you rolling with plus tires on your Honzo? Can't quite tell, I'm currently building a Honzo and am hoping to roll with Rekon+. Keep up the sick shots man! the selfie squad strikes again, that is a good one. "feel the rhythm, feel the ride, get on up, it's freeride time, COOL ROLLINGS!" @bigburd: Exactly what I was thinking... catch me riding down that slope of death? not likely! "allways remember, your bones wont' break in a bobsled, oh no... they shatter!" Very cool shot. This is your backyard? Great shot! Interesting to hear that you're using infrared beam too, I'd imagine that's way more time consuming to setup than a handlebar trigger? It sure is. However, this isn't the type of feature you can occupy your fingers with other things to do other than hold on. I'm surprised more people who are looking for an easy/free (if using nikon) setup don't just fire an intervalometer set on the fastest interval possible. Obviously infrared beam is the most accurate but you'd be surprised how accurate the free to use setup can be. @Matturalistic: wouldn't that result in hundreds of photos? Assuming it has a built in delay as well you could probably knock it down to 20-30 shots. He would have to start the timer, hike back up while keeping time. Drop in and hope you didn't go to early and if you went to late the buffer could be full and you might miss the shot. @Matturalistic: Intervalometer works for some situations, but not very accurate. @bradwalton: Hey dude what product are you using to trigger your Nikon? SICK aggro shot, captured it all, even the musty smell of the wet rock I swear. @guancho-libre: It does, yes. But you only have to use 1! Again not at all ideal, but for people wondering how to do this sort of stuff on a budget, it's a solution. I travel alone a lot for work, and used to use this method to get photos of myself in various places rather than a self timer trail and error! good job Brad keep up the great work! 1-160! Damn! Fired with a handlebar mount trigger? I wish the trigger was that simple, but I'm not gifted with multitasking. It's an infrared beam trigger. @bradwalton: haha that's even better, you used lasers! Really awesome photo. Never owned a full suspension bicycle, yeah HT! What a sweet looking line! Nice build, capture and shred Brad! Great photo, amazing trail. Really well done on both counts. Hell Yeah Brad!!! Incredible as always!!! Unbelievable shot! This is your own private home trail?! Can I come visit? I don't own it and several people have thrown dirt on it. I found the line a few years ago. An hour of steep pedaling to the top from home.